Most of central Paris is within walking distance. And on the afternoon we arrived, we did just that, walked around the old city – from the Eiffel Tower to the Arc de Triomphe, down the Champs Elysées to the Louvre, and back along the Seine to the Eiffel Tower again. Many other attractions are within easy reach. 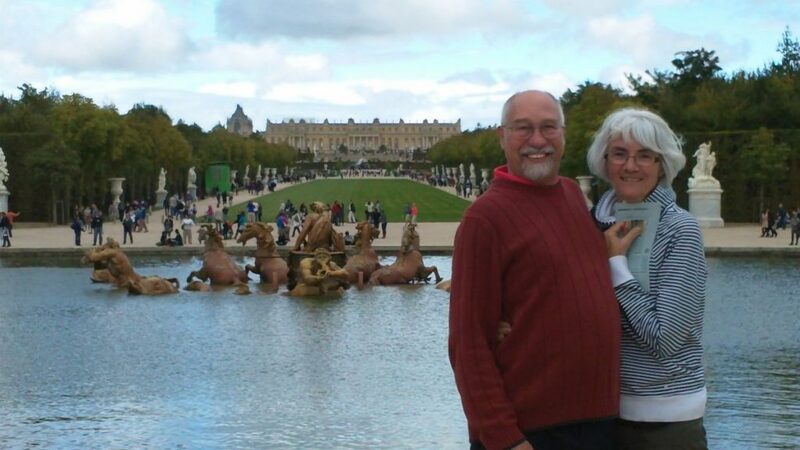 But the next day, our first full day, we ventured out of the city center to see the fabulous Château de Versailles. This palace and its surrounding gardens are about twenty kilometres from the city center and easily reached by train. Leaving the train station we walked a block and turned the corner and there it was. The front of the palace features lot of gilt work. What started out as a hunting lodge built by Louis XIII in 1624 was greatly expanded by the Sun King, Louis XIV from 1661 to 1678. It was expanded again from 1678 to 1715 when two large wings were added to flank the Royal Courtyard. This phase also saw the replacement of the west facing terrace with what is now the Hall of Mirrors, the most famous and most popular room in the palace. 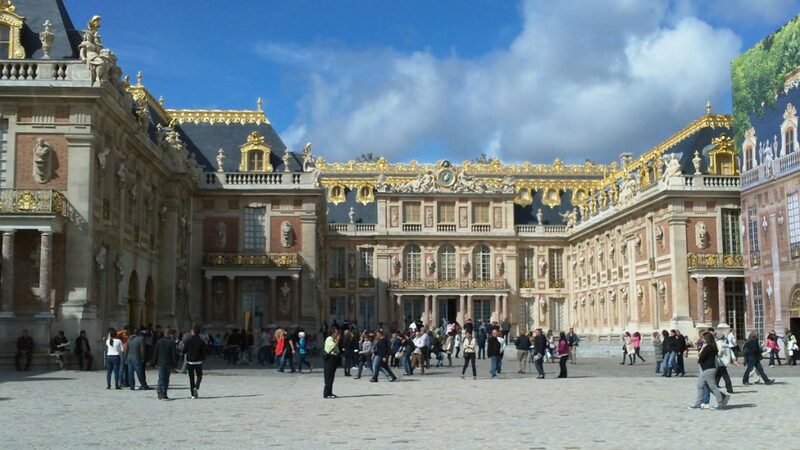 Versailles became the seat of power in pre-revolutionary France when Louis XIV moved the royal court there in 1682. It wasn’t until the French Revolution of 1789 that the seat of government was moved back to Paris. Janis and I at the Apollo Fountain with the palace in the background. 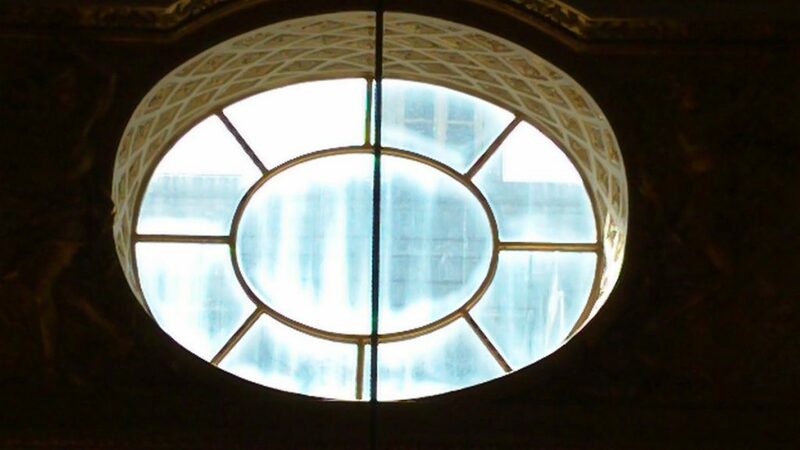 All the windows facing the gardens are from the Hall of Mirrors and its flanking salons. II. 7 18 November to Sieur du Metz, 43,475 livres 5 sols for delivery to Sr. Lois and to Sr. de Villers for payment of 142,196 livres for the silver balustrade that they are making for the king’s bedroom and 404 livres for tax: 48,861 livres 5 sol. II. 15 16 June 1681 – 23 January 1682 to Sr. Lois and Sr. de Villers silversmiths on account for the silver balustrade that they are making for the king’s use (four payments): 88,457 livres 5 sols. Additional figures are given for 1682. There was over a ton of silver in the balustrade alone notes Wikipedia, a “cost in excess of 560,000 livres”. And that was just the silver. All told, one estimate has the expenditures during Louis’s reign at over US $2 billion! So crippling was this expense that in 1689, Louis had all the silver in the palace sent to the mint to be melted down. Today the palace is a museum, a grand edifice filled with art and historical artifacts. We started our tour at the southern end of the North Wing. Walking along a vast corridor we quickly we came across a chapel complete with marble columns, a large pipe organ and a magnificently painted ceiling mural. 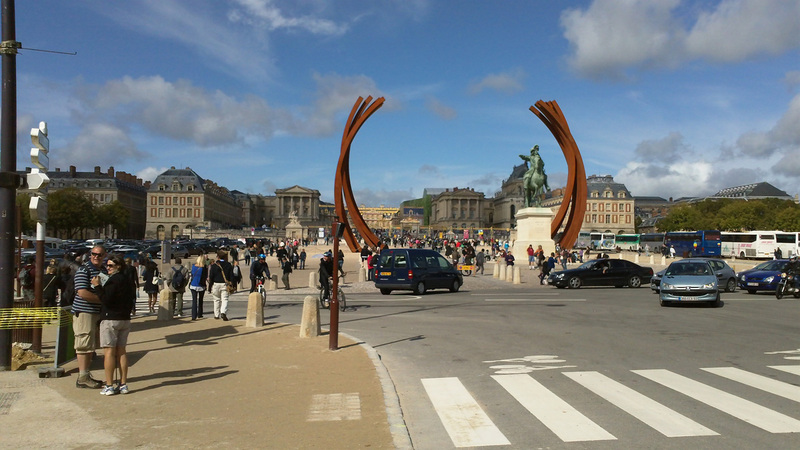 Continuing along the corridor, we came across numerous works of art including a statue of Joan of Arc. At the end of the wing, we ascended a staircase to the second floor and walked back again. 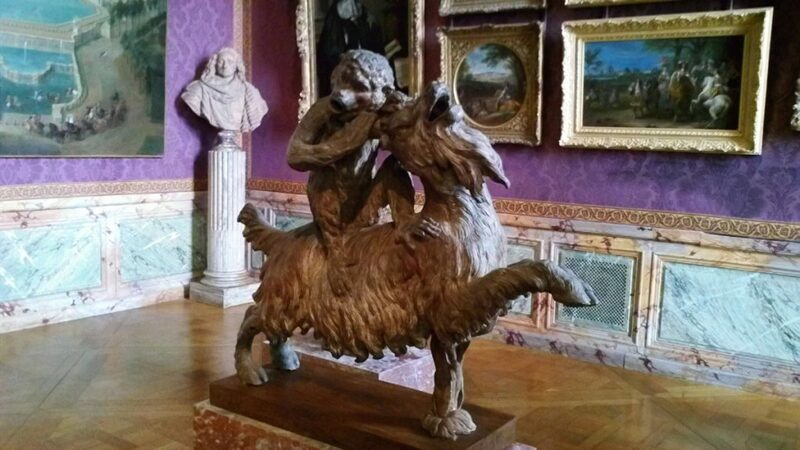 One of the more interesting pieces of statuary was a monkey riding a goat. The long corridor was flanked by various paintings and sculptures on the left and tall windows on the right. It was through these windows that we caught our first glimpse of the magnificent gardens behind the palace. The garden we saw, the North Parterre, is just a small fraction of the overall gardens. At the end of the passage we came to large room, a corner room that marks the transition into the original Château. 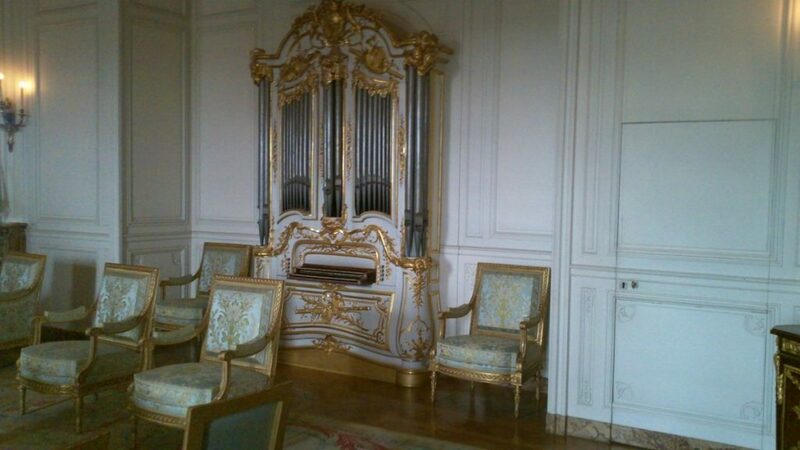 The room is called the Salon d’Hercule or Salon of Hercules. It is the first of a series of such Salons that we encounter on our way to the Hall of Mirrors. The size of the room is immense – huge vaulted ceilings all covered in elaborate and colorful murals. The pillars are solid marble. And at one end hangs a huge painting. The video below captures the sheer size and majesty of the room. From the Hercules Salon we head west, passing through the Abundance Salon, Venus Salon, Diana Salon, Mars Salon, Mercury Salon and Apollo Salon before arriving at the Salon of War which bookends the Hall of Mirrors. These rooms are referred to as the King’s State Apartments and were antechambers to the royal residence where gatherings, parties and amusements were held. Each of these rooms is filled with art and very elaborate decorative work. And each has giant ceiling frescoes as well. The Salon of Mars was originally a bedchamber. 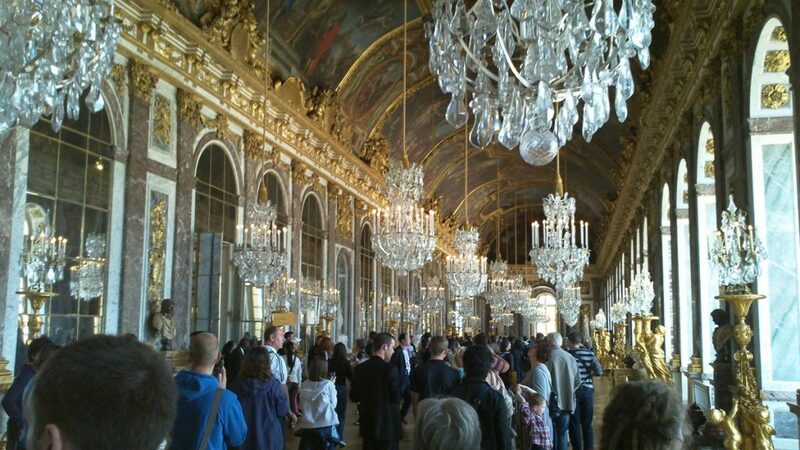 The Hall of Mirrors is one of the main attractions at Versailles. When it was built, mirrors were an expensive commodity and Venice had the monopoly on production. Louis’s Finance Minister Jean-Baptiste Colbert lured a number of Venetian workers to Paris to work in the Royal Glass and Mirror Works. The Venetian government retaliated by sending assassins to kill these workers to protect Venice’s trade secrets. Nevertheless, the Hall was built. The great corridor runs 239.5 feet from one end to the other and is flanked by the Salon of War and the Salon of Peace. Its width is 34.4 feet and the vaulted ceiling soars 40.4 feet above the floor. The space occupied by the hall used to be a terrace overlooking the magnificent gardens stretching behind the château. Today large windows overlook the gardens. On the interior wall are seventeen mirror-clad arches. Many fine pieces of sculpture line the hall and it is flanked on both sides by giant candleabras. From the Salon of Peace we made our way to the royal bed chambers. 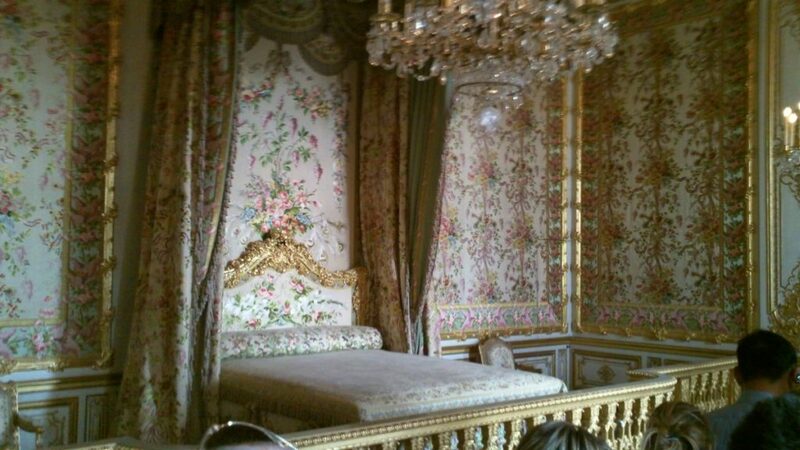 The king himself had a large canopy bed and had a separate room from the queen. Her bedroom had a larger bed than the king. Near the King’s Room were several antechambers where the King and his aides could meet to discuss affairs of state. Central to them all is the Bull’s Eye Room or as it is called in French, the Salon l’Oeil de Bouef. 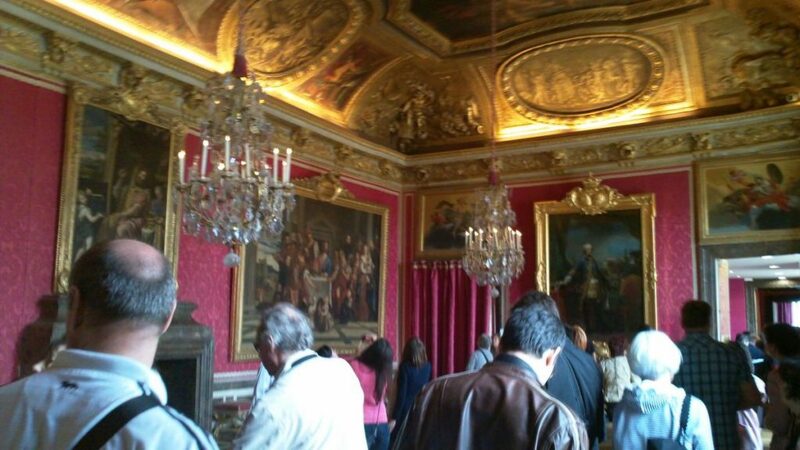 This room had exits to the King’s bedroom, the Queen’s Apartments and the Hall of Mirrors. It also had a staircase leading to the Dauphin’s apartments below. 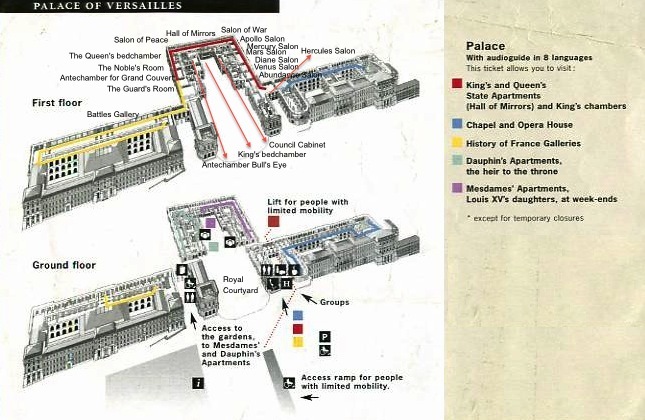 After passing through various other rooms including the Guard’s Room, we descended to the ground floor where staff and guests stayed, as well as the Dauphin. These guest rooms themselves were very lavish. Paintings and sculptures abound as well as a grand piano and an organ. 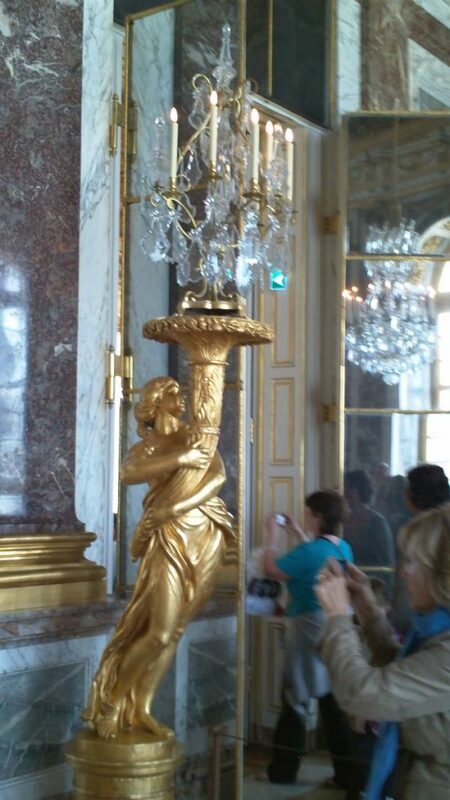 The Palace at Versailles is magnificent. It cost an unbelievable amount of money to build and included many pieces of furniture made of solid silver. Many later had to be melted down to pay some of the royal bills. But the grandeur and elegance of the period remains evident today. In my opinion, this is one of the wonders of the modern world, a must-see if you are ever in Paris. 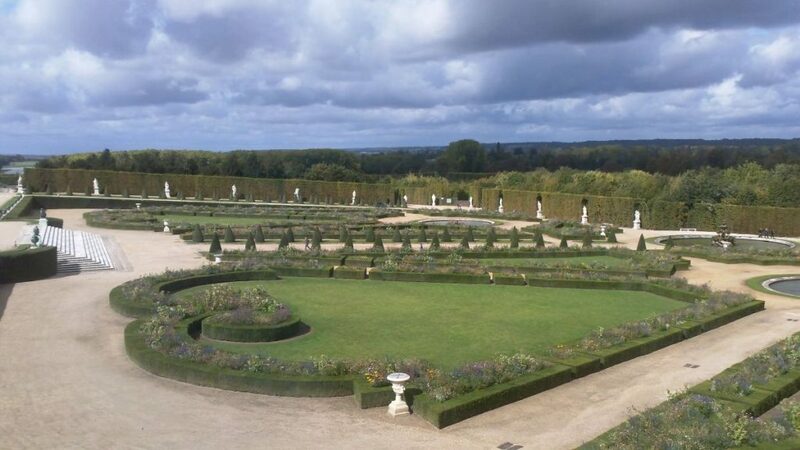 But if you think the Palace is magnificent, prepare to be blown away by our next installment – Les Jardins de Versailles. The entire estate covers over 800 hectares or close to 2000 acres. This includes the Palace, the Gardens, the Park (which is a free public park), and the Trianon Estate (Marie Antoinette’s private estate). The gardens are a work of art – carefully landscaped and tended and abounding with sculptures and fountains, it is as much an attraction as the Palace itself.